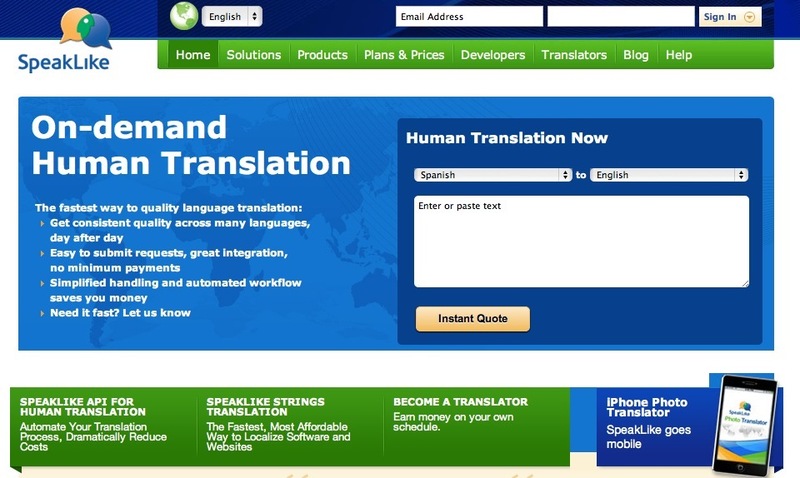 Speaklike, founded in 2008, is a New York based translation technology and services company. Speaklike first launched at the DEMO conference, and was among the first companies to offer professional translation as a highly automated web service. Their service is a good fit for software developers and channel partners who need highly automated translation, combined with a lot of control over things like turnaround time, service level agreements and other parameters. Headquartered in New York’s Chelsea district SpeakLike has carved out a niche for itself by offering a highly customizable translation process. Speaklike was founded in 2008 by entrepreneur Sanford Cohen and developer Graham Neuman. Speaklike’s API offering is easy to work with, but unlike other API based translation services, it provides a lot of options for adjusting turnaround time, selecting translators, and other parameters that other providers have not focused on. This is partly because the company has focused on financial news services that have very particular turnaround time and quality requirements, and because of the company’s early history as an instant messaging translation service. SpeakLike is a good fit for software developers and channel partners who are looking for a highly controllable translation process. Other providers such as Gengo, One Hour Translation and Straker Translations also offer web service APIs, but provide a limited range of options in terms of adjusting response time, SLAs, etc, which is something SpeakLike has focused on because of its history providing real-time and near real-time translation services. For example, if you need to force a 4 hour response time requirement for some translations, but can use 48 hours for others, their system allows you to do that. Examples of where this is important are news translation, email/IM translation, and other situations where time sensitive materials need to be processed within a defined time period. I generally recommend that software developers take time to integrate with two or more API providers, so they have flexibility in sourcing translations. For example, you may have a requirement for a specific language that provider A does not support well, but provider B can scale up to offer quickly. It generally takes about a day or two to build a basic API connector to one of these services, so within a week or two, you can implement connections to the leading providers, and then be able to source your translations dynamically based on who provides the best service for a specific language, SLA requirement, etc. This entry was posted in APIs, document translation, reviews, translation agencies and tagged agency, lsp, speaklike. Bookmark the permalink.